The helicopter gunship in question is the MD-530 F “Cayuse Warrior” light attack helicopters, some of which were recently involved in a combat mission south of Jalalabad. One pilot talking to the New York Times, however, noted that the helicopters lack gun sights for its two .50 caliber machine guns, making targeting very difficult. 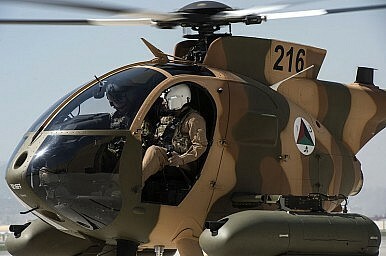 As I reported last months (See: “Afghan Air Force to Receive 5 More Attack Helicopters”), the Afghan Air Force (AAF) is converting five unarmed MH-6 “Little Bird” aircraft into “Cayuse Warrior” light attack gunships bringing up the AAF light attack helicopter fleet to 16. The five MD 530F will be retrofitted with a so-called Enhanced Mission Equipment Package (EMEP) at a facility in the United States and return to Afghanistan for the 2016 fighting season. Next to the machine guns, the five helicopters will be armed with 70 mm rockets, which will increase the gunships stand-off range from about 1,900 meters to about 8,000 meters. One of the principal reasons for rushing MD-530 Fs to the frontlines is delays in the delivery of 20 Brasilian-made Embraer EMB 314 Super Tucanos, aka A-29s, fixed-wing aircraft specifically designed for counter-insurgency operations. The first A-29 is slated to enter service at the end of 2015. However, as I noted in a previous piece (See: “When Will the Afghan Air Force Be Ready to Fight the Taliban?”), only a handful of aircraft will arrive in 2016, with the majority being delivered in 2017 and 2018.